LOL Does he point at bookworms? SO handsome! Please tell me his name is Baskerville. The shelter tells me his old name was Nico, not sure if that will stick or not. I was thinking of naming him Mark; my other dog's name is Book. Nice socks. I suppose Shelf is out of the question. Very cute! Looks like a mixed breed? The coat looks kind of brindle but also a little shepherdy? Very sweet boy. Big paws though. How old? 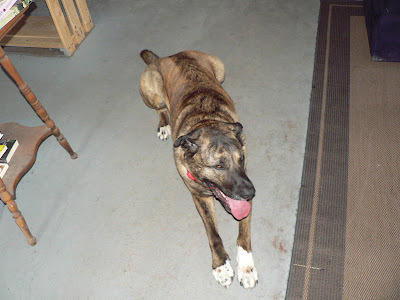 Yes, he has a fantastic brindle coat. Soo soft. He's about three or so.